U.S. bioethics commission to study bioterrorism, the anthrax vaccine, and children. 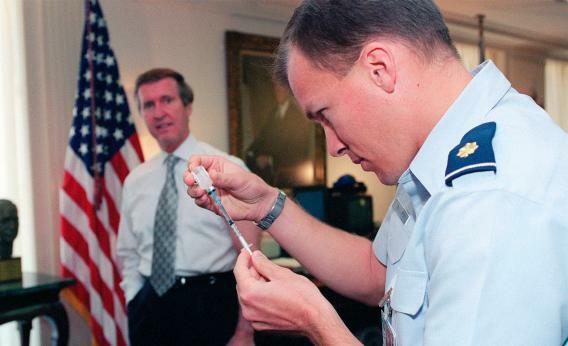 Virginia Air Force Flight Surgeon Maj. Timothy Ballard (R) prepares to administer the final shot in the six-dose series of anthrax inoculations to Secretary of Defense William S. Cohen (L) in Cohen’s Pentagon office on Sept. 24, 1999. Photo by Newsmakers / Liaison Agency. The U.S. administration will weigh the potential risks and benefits surrounding ways to shield children from bioterrorism and methods to treat them after an attack. The Presidential Commission for the Study of Bioethical Issues is set to tackle the issue in the spring, after a request from Health and Human Services Secretary Kathleen Sebelius, according to the commission’s blog. This development comes largely in response to recent debate over the testing of the anthrax vaccine, long controversial among service members, on children. The anthrax vaccine was tested on adults and is administered to military personnel in bioterrorism defense units, according to the Washington Post. But there’s no assurance that the vaccine wouldn’t harm children. This is a very tangled, thorny issue. The commission’s blog noted that children cannot give informed consent, complicating testing. Furthermore, parents may be reluctant to sign their children up for an experimental anthrax vaccine because the risk of another anthrax attack seems small, according to another Washington Post story. A recent study found that different people react differently to anthrax: some are not affected at all, while others are far more sensitive. Though sparked by the debate over the anthrax vaccine, the commission will likely look at the larger issue: gathering information on how to protect children from bioterrorism on the whole.